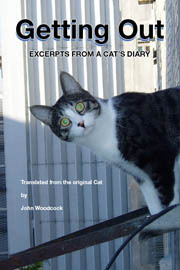 Getting Out - Excerpts from A Cat's Diary - Everyone - Has Something To Sell! Everyone - Has Something To Sell! As the title of this page says, from Nemo to Shrek, Racketeer to Multinational everyone has something to sell and I am no different, you can join my Escape Committee, which is a fancy way of describing full site membership, which unbelievably is free - am I doing something wrong here? In the store you can buy transfers for t-shirts with me on, yes that is more like it I like the idea of you buying things from me and most of all you can pre-order my books years in advance, before I have even written some of them in fact and what a marvellous offer that is, isn't it? There is a list below of the things you can buy so do spend hours deciding exactly what you want, try them on and then most importantly BUY them and BUY them today! In the future you will be able to buy mugs with my mug shot on, designer wear designed by some incredibly talented designer, yes thank you that designer is me - how clever of you to guess! I have written one book so far and am in the process of getting it published, or should that be the slow process of getting it published, yes that sounds about right, so in the meantime you can download a copy of my book on line, they call them e-books I think, yes that must be right, 'e' for 'download,’ obviously a term invented by a very clever Human! I should stress that this is a 'not for profit website - it is just for income! So here is a list of the stuff you can buy or better still, stuff you can win if you are a member of the Escape Committee. Some of the above items might exist only in the Feline imagination of the creator of this website. Buy it here now before the moths get it or it goes off.